Most of the first-line antituberculous drugs (ATD) are highly effective and relatively safe. ATD induced fever is a rare occurrence. However, it has been reported with several ATDs including streptomycin (S), pyrazinamide (Z), isoniazid (H), rifampicin (R), ethambutol (E). ,,, However, drug fever induced by both H and R is rarely reported. We are reporting a case of tuberculous pleural effusion that developed drug induced fever with both H and R, due to its rarity and presence of atypical features. He was subsequently treated with a modified daily regimen containing S, E, Z and levofloxacin (Lfx) with good clinico-radiological recovery. A 52-year-old non-smoker, non-alcoholic male with a history of non-productive cough, right sided pleuritic chest pain and low grade fever for 3 weeks attended the local health center. 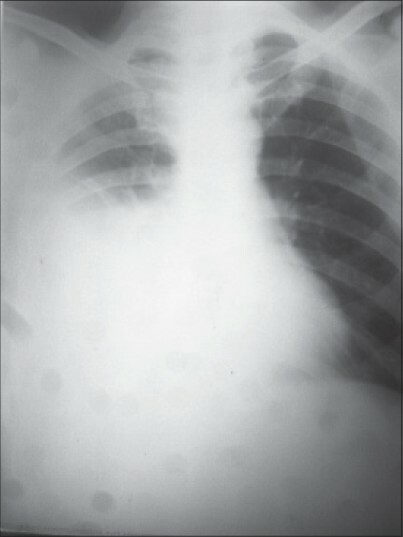 Chest radiograph revealed right sided pleural effusion [Figure 1]. Sputum smear for acid fast bacilli was negative. Pleural fluid study showed straw colored fluid with protein 4.7 g/dL, glucose 49 mg/dL, total cell count 567/cmm, neutrophils-20%, lymphocytes - 78, adenosine deaminase (ADA)-90.5 U/L. With a diagnosis of tuberculous pleural effusion, he was put on daily therapy with H-300 mg, R-450 mg, Z-1500 mg and E-800 mg without corticosteroid. On chemotherapy, his cough and pleural pain reduced from 10 th day and fever subsided on 14 th day. On the 20 th day of chemotherapy, he developed spiking fever with chill and rigor and was referred to us for evaluation and was admitted in the chest ward of our hospital. On interrogation, he gave no history of hemoptysis, nausea, vomiting, headache, abdominal pain or increased frequency of micturition. He was not taking any other medicine at the time of presentation. He denied any past history of drug or food allergy. On examination, he had body weight-46 kg, pulse rate-102 beats/min, blood pressure 124/80 mm Hg and respiratory rate-20/min. Oral temperature-102°F and SpO 2 97% at room air, but there was no skin rash, jaundice, peripheral lymphadenopathy or joint swelling. Examination of chest revealed centrally positioned trachea with dull note on percussion, impaired vocal resonance and absent breath sound in right side. Examination of other systems revealed no abnormality. Investigation revealed hemoglobin-11.2 g/dL, total leucocyte count-7200/cmm, neutrophils-60%, lymphocytes-32%, eosinophils-6%, monocytes-2% and erythrocyte sedimentation rate (ESR)-48 mm in 1 st h. Blood for malaria parasite was negative. Serum immunoglobulin E (IgE) was 300 ng/mL. Serological test for human immunodeficiency virus was non-reactive. Fasting plasma glucose, serum urea, creatinine, lactate dehydrogenase (LDH) and liver function tests were within the normal limits. Blood for anti-nuclear antibody and rheumatoid factor was negative. Urinalysis was normal. Culture of blood and urine did not grow any organism. Repeat chest X-ray posterior anterior view revealed right sided pleural effusion. Diagnostic thoracentesis did not reveal pus. Ultrasonography of abdomen was normal. A presumptive diagnosis of drug induced fever was made and all ATDs were stopped. His temperature came down to 97.3°F and did not increase in the next 4 days. To find out the offending drug, he was put on H-100 mg on day 1. His temperature rose up to 101°F along with chill and rigor within 3 hours, but it was not associated with nausea, vomiting, skin rash, jaundice or arthralgia. H was stopped and he remained afebrile for next 3 days. On the following day, when he was challenged with R-150 mg, he again developed fever with chill and rigor within 4 hours. R was also stopped and he became afebrile. Subsequently, he was put on E, Z and S, one by one, in the same graded manner, but without any adverse reaction. We also added Lfx-750 mg daily to make the regimen more effective. He was finally put on a daily regimen containing E, Z, S and Lfx. His fever did not reappear subsequently. He made an uneventful recovery with gradual clinico-radiological improvement. Z was omitted after 2 months of chemotherapy while other drugs were continued for total 1 year. Tuberculous etiology of pleural effusion in our case was established in this case due to its presence of high ADA level and lymphocyte: neutrophil more than 0.75 in pleural fluid. Both H and R appeared to be the offending drugs responsible for fever because fever appeared on the challenge dose of both of them and disappeared on their withdrawal. There was no other obvious cause of fever detected in our patient. However, drug specific antibody levels were not measured in this case due to lack of facilities. Drug induced fever can be produced by several drugs including allopurinol, captopril, penicillin, cephalosporin, erythromycin, phenytoin, barbiturates etc. Drug induced fever may be due to effects of the drug on thermoregulation, administration-related reactions, pharmacologic action of the drug itself, idiosyncratic response and hypersensitivity reactions. Hypersensitivity reaction, the most common mechanism of drug fever may be immune complex mediated (type-3), cell mediated (type-4) or IgE mediated (type-1). In the commoner immune complex mediated reaction, drug itself or its metabolite may act as either a complete antigen or a hapten. The formation of circulating antibody-antigen complex in combination with consumption of complement can stimulate the release of pyrogen from granulocytes, resulting in fever. The presence of antibody in the serum does not always prove a hypersensitivity reaction since it can be present in a patient without any sign of drug reaction. Moreover, the failure to detect the presence of antidrug antibody does not rule out hypersensitivity-induced drug fever since the antibodies formed may not be directed against the drug itself. In general, fever appears 7-10 days after starting the drug in such reaction, remains elevated at a constant level and subsides rapidly with withdrawal of the offending drug, only to recur within hours of re-challenge with the drug. R induced fever occurs either as a part of generalized hypersensitivity reaction or due to flu-like syndrome. H induced fever is also generally a component of hypersensitivity reaction but can be due to other mechanisms. Though hypersensitivity is the most probable explanation of fever in this case, there are few atypical features such as absence of skin rash, increased ESR, increased LDH, eosinophilia, proteinuria or abnormal liver enzymes and rare occurrence of same reaction with two drugs. Similarly, there is only one case report of drug fever with both H and R in a patient with mycobacterium avium complex infection. However, we could not find any case report of drug induced fever with both H and R occurring in patients with tuberculosis (TB). Our case is unique in this regard. The flu syndrome often occurs within 3 rd to 6 th month of chemotherapy with R and includes various combinations of fever, rhinorrhea, chill, faintness, headache, myalgia, arthralgia or hypotension. It is due to development of circulating R-dependent antibody. It appears within 2-4 h of drug administration, lasts for up to 12 h and is most frequent at higher doses given in once or twice weekly regimen. However time of occurrence of fever, absence of other associated features, rarity of occurrence with daily regimen of such dose and concomitant H induced fever almost exclude flu syndrome as a cause of fever in our case. An interesting case of H induced fever is reported in patients who take alcohol or cheese during therapy with H.  This occurred due to H induced inhibition of mono - amine oxidase with accumulation of tyramine and histamine derived from these foods. This is not the cause in our case as the patient had no history of ingestion of these foods. Other causes of persistent fever in patients with TB includes new septic foci, concomitant other fever-producing illnesses, drug resistance or sub therapeutic drug concentration due to malabsorbtion were reasonably excluded in our case by clinical examination, relevant investigations and good therapeutic response with ATD. Drug fever poses a particular problem when it occurs during the course of a fever-producing infection. Diagnosis of drug induced fever is only confirmed after elimination of other causes, the demonstration of the temporal link between initiation of the drug and the onset of fever and the resolution of fever within hours of stopping the causative agent. Though rare, drug induced fever should always be considered in a febrile patient of TB on ATD. 1. Mina LP, Rai M, Pathak A, Garg S, Bharti A. Rifampicin induced fever. IOSR J Pharm Biol Sci 2012;2:25-7. 2. Chien HP, Huang ST, Yu MC, Wu IH, Lin TP. Ethambutol-induced pulmonary infiltrates with fever and skin rash: A case report. Zhonghua Yi Xue Za Zhi (Taipei) 1998;61:371-4. 3. Rosha D. Prolonged fever occurring during treatment of pulmonary tuberculosis-an investigation of 40 cases. Indian J Tuberc 2001;48:147-9. 4. Lee CH, Hsiue TR, Chen CW, Chang HY, Chen CR. Isoniazid-induced fever. J Formos Med Assoc 1996;95:632-4. 5. Takayuki T, Shin′ichi T. Spiking fever induced by isoniazid and rifampicin for mycobacterium avium complex infection. Med J Ibaraki Prefectural Hosp 1998;16:67-70. 6. Light RW. Pleural Diseases. 5 th ed. Baltimore: Lippincot Willams and Wilkins; 2007. 7. Roth AR, Basello GM. Approach to the adult patient with fever of unknown origin. Am Fam Physician 2003;68:2223-8. 8. Patel RA, Gallagher JC. Drug fever. Pharmacotherapy 2010;30:57-69. 9. Frieden T, Espinal M. What is the therapeutic effect and what is the toxicity of antituberculosis drugs? In: Frieden T, editor. Toman′s Tuberculosis Case Detection, Treatment, and Monitoring-Questions and Answers. 2 nd ed. Geneva: World Health Organization; 2004. 10. Toutoungi M, Carroll RL, Enrico JF, Perey L. Cheese, wine, and isoniazid. Lancet 1985;2:671.